The perseid meteors radiat from the northeast, but can be seen in all parts of the sky. From the overlook on at the 360 Bridge near Austin, Texas, the milky way can be seen in the northwest portion of the night sky in the early hours before sunrise. Here, as the perseids put on a fireworks show, clouds slowly moved across the heavens. This time-lapse photograph shows the many meteors the camera captured from just before 2:00am until a little after 5:00am. The flow of traffic shows the head and tailights over the course of these hours. The milky way often doesn’t show up this clearly so close to the city, so I used some push-pull post processing on photoshop to bring out the dim light of such distant sarts and galaxies. The perseid meteors radiat from the northeast, but can be seen in all parts of the sky. 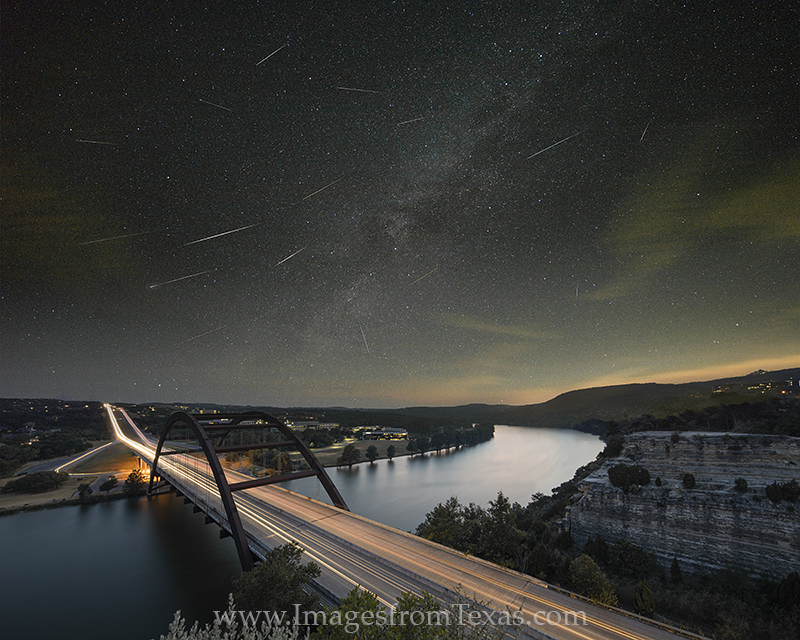 From the overlook on at the 360 Bridge near Austin, Texas, the milky way can be seen in the northwest portion of the night sky in the early hours before sunrise. Here, as the perseids put on a fireworks show, clouds slowly moved across the heavens. This time-lapse photograph shows the many meteors the camera captured from just before 2:00am until a little after 5:00am. The flow of traffic shows the head and tailights over the course of these hours. The milky way often doesn’t show up this clearly so close to the city, so I used some push-pull post processing on photoshop to bring out the dim light of such distant sarts and galaxies. Photo © copyright by Rob Greebon.